Product prices and availability are accurate as of 2019-04-08 18:49:29 EDT and are subject to change. Any price and availability information displayed on http://www.amazon.com/ at the time of purchase will apply to the purchase of this product. Dialing up perfection has never been easier. The Incanto S-Class Rondo RS SBS is one of the newest Saeco super automatic machines designed with the serious coffee drinker in mind. Experience individual flavor ¿ with one turn of the dial The Saeco Brewing System makes it easy for anyone to brew coffee precisely to their individual tastes. The SBS feature regulates the amount of water pressure used to brew each cup, which changes the consistency and flavor of the espresso. Turning the dial located on the front of the dispensing head to the right delivers a robust Italian espresso, turning it to the left delivers a milder, American-style cup of coffee. A truly innovative feature, the Incanto Rondo has a brewing dial which allows the user to choose from 1 to 8 ounces of espresso/coffee. Simple turn the dial to the amount of coffee desired and press the brew button for delicious coffee. If you want two cups, press the two cup button, and the machine will automatically brew two cups of espresso/coffee. 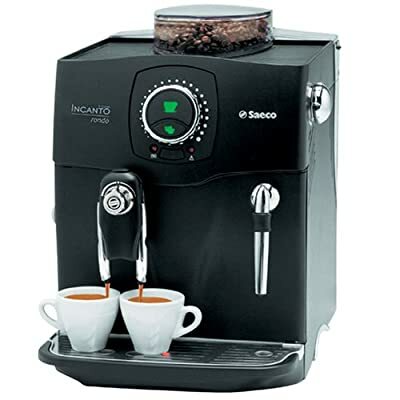 A truly innovative feature, the Incanto Rondo has a built-in ceramic disc grinder.